Have a better perception of the time of day in large, bold letters without confusing abbreviations! This digital calendar clock by DayClox clearly spells out the full DAY of the week and the MONTH (and date) in large, bold letters - without confusing abbreviations. Many elders suffering from memory loss due to stroke, dementia, Alzheimer’s or just advancing years, may have difficulty processing abbreviated words. Most clocks available today will abbreviate the display of the month and the day. For example, November becomes NOV and February is cut down to FEB. The same is true for days of the week – Wednesday, is often displayed as WED and Saturday as SAT. This may be fine for the rest of the population, but for our loved ones with Dementia, early stages Alzheimer’s or just simple advancing years, these abbreviations are often too confusing to process. 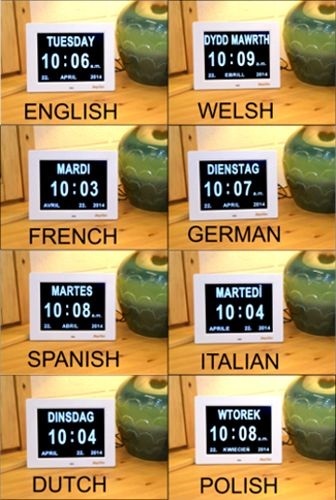 This clock displays Complete words only, no abbreviations! This quiet reminder clock or 8” Digital Calendar Day Clock with an LCD screen, has the clearest and easiest to read display available & it automatically dims at 7:00 p.m. for nighttime use. This clock has everything! It displays the full DAY, TIME and DATE and it’s not just for people with memory loss. Anyone can enjoy this wonderful clock. It’s sleek & contemporary design will look great anywhere in your home or office. This clock can display 12 hour am/pm or 24 hour Military Time.It can be wall mounted or just pull out the kickstand and display it on your desk or counter. Our Digital Calendar Day Clock was designed for those experiencing memory loss due to Alzheimer’s, Dementia and Stroke, and we think it would be a beautiful addition to any home... plus it makes a great gift! Our clock is designed to remain connected to the power supply at all times, but a battery backup maintains the correct day, time and date if it is unplugged. Overall Dimensions: 8.5" wide x 6.75" high x 1" deep (4.5" deep with Kickstand). 8" diagonal display screen. Can be used as a Desk clock or Wall clock. The clock requires an A/C adapter (included) to operate. Does not run on batteries. Features 8 different languages! This calendar day clock enables those with Alzheimer's and other forms of Dementia, to have a better perception of the time of day. Rather than displaying the time, the clock displays a period during the day or night, along with the actual day. This digital calendar day clock features a large, bright and clear display that can be seen from across the room. It's bold and clear display is helpful for the vision impaired and the elderly.